← Cinderella, what big, sharp teeth you have! I wrote a post here nearly two years ago (at my yearly movie outing, so sad!) about Wes Anderson. 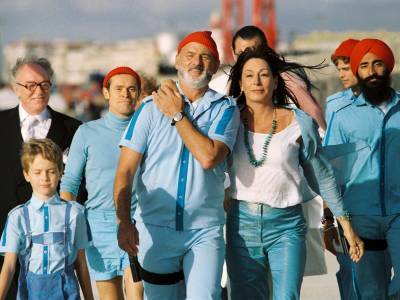 Today, I watched “The Life Aquatic” again on DVD and though I adore it, it was as if I had never seen it before. Turns out I barely remembered the movie, though it’s my favorite of Anderson’s. I noticed things this time I either saw and forgot or never saw. I watched the background this time, allowed myself to look away from the principal humans and around the room, as it were, and linger in my tour of the Belafonte. When a work of fiction is so confident in itself that the reader just enters the world and goes with it. Applies equally to a written or cinematic world, but as I thought about it today, I realized how I’m not quite doing that with my new novel, and thought of one little way that I can follow the BBP more closely. For which I owe Mr. Anderson a card of thanks. If only I had some Kinglsey (Ned) Zissou corrsepondance stock. This entry was posted in Uncategorized and tagged Buckaroo Banzai, fiction, Interdisciplinary Aesthetics, Jeff Goldblum, movies, Wes Anderson. Bookmark the permalink. Maybe you caught this and just don’t count it as part of the curtain call — although he’s not marching with the rest of the team, Ned is in the final shot. He’s manning the lookout tower on the boat. I thought that was pretty awesome. It’s as if the teachings of Zissou gave in him the spirit to do his duty and watch out for pirates. I’m so glad you mentioned that! I did see someone, and was speculating as to whether it was Ned. Now I need to watch it all again! Thanks for stopping by.